Visit our partner, The Trailblazer Foundation. Donate any amount you can towards building a well. A donation of $220 funds a complete well and pump, which will bear your name! It's difficult for us to imagine not having such a basic necessity of life as clean, potable water. Yet according to UNICEF, nearly 900 million people in the world don't have this luxury. Almost half are children. Globally, the second leading cause of death for children under 5 is waterborne illness. We've seen this first-hand in Cambodia, where we visit the World Heritage Site of Angkor Wat. We learned that many of the villages in the area had little or no access to clean, potable water. in a country where the average income is less than a dollar a day and 40% of the population lives in poverty, many Cambodians in rural areas simply can't afford the cost of clean water. In 2007, we met Scott & Chris Coats, an incredible couple who had founded The Trailblazer Foundation a few years earlier to build wells and schools in Cambodia. We were amazed to discover that for as little as $220, Trailblazer can dig a well and install a pump that provides clean water to several dozen families. We've supported them ever since, and together, we've dug hundreds of wells. 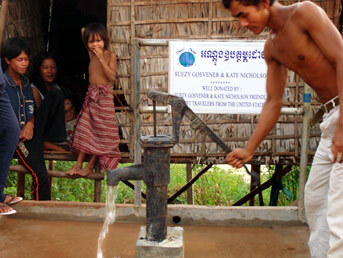 As a sign of goodwill and a thank you for welcoming us into their country, we've been funding the construction of wells since 2007, bringing clean water to villagers around Siem Reap. Seeing this, several of our passengers have volunteered to fund wells themselves. Together, we've built over 200 wells! You can too! Through Trailblazer, you can donate towards building a well. A $220 donation funds a complete well, and it will bear your name. Fund one yourself, or on behalf of someone you love. It's hard to imagine money better spent. Want to learn more about Trailblazer's amazing work? Watch the touching 9-minute video above, visit their website, or read Chris & Scott's inspiring story.